Mr. Mattioli’s point may have been lost on the gun rights advocates who interrupted his testimony with shouts about their 2ndamendment rights. Be that as it may, it’s become clear that America has reached a tipping point on the issue of guns: a sufficient number of people are so dissatisfied with the results of the status quo that they feel motivated to change it. Results are a product of actions. Actions are a product of attitude. And attitude is a function of philosophy. So if we really want to change our results then we have to look at the philosophy or worldview that produces our attitude. In other words, if the problem is a lack of civility then we have to examine our philosophy in order to understand where that lack of civility comes from. The argument I made in my last post was that our culture of violence is supported at its core by our eating habits, that the unavoidable consequence of institutionalized violence against animals is the extension of violence into human society. The prevalent attitude in America is that selective violence against animals for the sake of providing food to human beings is natural, necessary, and even desirable. The philosophy that supports this attitude is one of bodily identification; an association of the self with the body that justifies violence against other species for the sake of fulfilling bodily needs or desires. Ruthie Streiter commented on my post, suggesting that “vegetarian food” is not necessarily “peaceful food”, that “the death toll on a vegetarian meal may be far greater than eating a grass-fed heirloom cow from a local organic farm”. She recommended a book, The Vegetarian Myth: Food, Justice and Sustainability, in support of her claim that we are our bodies and we are biologically designed to eat meat. The biological argument has long ago been thoroughly debunked and after barely a moment of research the author of the book epically failed my credibility test. In spite of all that, Ruthie makes a good point about a law of nature that’s supported by yoga wisdom texts: jivo jivasya jivanam – one living entity is the life for another living entity. It’s not possible for human beings to eat without harming other living beings. Does this mean that a culture of non-violence is impossible? Hardly. In direct opposition to the modern worldview, yoga philosophy proposes a categorical distinction between the self and the body and suggests that the sanctity of an action is in the motivation for that action, not in the action itself. Traditional yoga wisdom texts encourage us to re-frame our motivations, to act for the pleasure of the eternal Supreme Person rather than pursue temporary bodily pleasures. This directive comes with detailed instructions as to how this can be done, including instructions about what kind of foods human beings should consume and, even more importantly, to whom such food should be offered before we consume it. If our motivation for embracing a vegetarian diet is to be compassionate to animals or to bring about a peaceful world by reducing the level of violence in it, well, that’s nice but it’s insufficient from the standpoint of yoga. It may be good karma but there’s nothing inherently spiritual or yogic about it; good karma binds us to the material world as much as bad karma does. On the other hand, if our motivation for offering our food to Krishna, or the Supreme Being, is to please Krishna, then we raise our actions to a selfless spiritual level that negates all karmic consequences associated with the acquisition and preparation of the food being offered. The point of an ethical vegetarian diet in yoga is to eliminate our karmic debt and bring our senses into a peaceful place that’s conducive for the practice of yoga. The positive effect such a diet has on the material world is a fortunate by-product but it’s not the goal in and of itself. People who eat meat and other animal products sometimes offer a reasonable challenge to animal rights activists: “You say we shouldn’t eat meat but you’re eating vegetables: do you think that’s not violence?” Well, they’re right: eating vegetables requires violence. Vegetarians are committing violence against other life forms because plants are also living beings and the collateral damage of growing and harvesting vegetables is incalculable: there are more living entities living in two square feet of soil than there are human beings on planet Earth. 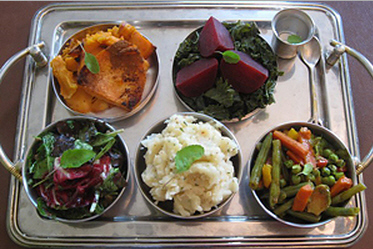 Those on the path of yoga are therefore enjoined to minimize the violence associated with the acquisition of food as much as possible and to become freed from all the karmic reactions that are otherwise unavoidably associated with food production and consumption by offering vegetarian food to the Supreme Person with as much devotion as we can muster before consuming it ourselves. In Sanskrit such food is called prasada, mercy.